Martin Luther King Jr. outlined his dream 50 years ago this weekend. We made much of it happen. Let’s dream some more. Let’s dream about what we could do in the next 50 years. Fifty years ago Martin Luther King Jr. led the March on Washington for Jobs and Freedom and famously told the country “I have a dream.” Fifty years later there is progress and there are setbacks. We no longer have segregation — separate schools and bathrooms and the rest. Many states finally allow everyone to marry the person they love, but at the same time many states are returning to apartheid-era restrictions of voting rights. One huge part of the “Jobs and Freedom” Dream that still evades us is the goal of full employment or an income until a job becomes available. The fact is that the work which improves the condition of mankind, the work which extends knowledge and increases power and enriches literature and elevates thought, is not done to secure a living. It is not the work of slaves driven to their tasks either by the, that of a taskmaster or by animal necessities. It is the work of men who somehow find a form of work that brings a security for its own sake and a state of society where want is abolished. Our country was founded on the dream that We the People can do things for each other instead of depending on the rich and powerful to throw us scraps. If you look at our Constitution you see that our country is supposed to be for We the People. And I mean just look at it, not read it. The only words you see from any distance are the words “We the People.” The Founders were making a point. 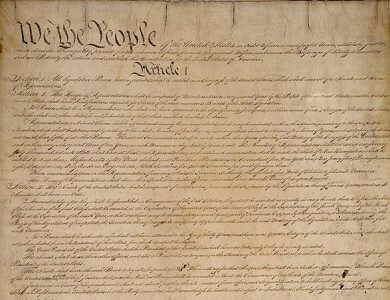 The Constitution told the world about a dream that “We the People” would build a country that protects and empowers us, where together we do things for the common good, to make our lives better. And for a while we did that. We have lost sight of that dream. We no longer seem to recognize who our country is for. We no longer talk about the common good. Who is our country for? Who is our economy for? Certainly a We the People economy would at the very least guarantee that We the People have jobs and an income until a job is available. King pointed out in his “Where Do We Go From Here?” speech that jobs and/or an income fix many other problems beyond just poverty. “… we are likely to find that the problem of housing, education, instead of preceding the elimination of poverty, will themselves be affected if poverty is first abolished.” He said in this speech that a job or an income fixes housing decay and means personal conflicts between husband, wife, and children will diminish. John Kenneth Galbraith said that a guaranteed annual income could be done for about twenty billion dollars a year. And I say to you today, that if our nation can spend thirty-five billion dollars a year to fight an unjust, evil war in Vietnam, and twenty billion dollars to put a man on the moon, it can spend billions of dollars to put God’s children on their own two feet right here on earth. A full-employment economy with a guaranteed income until a job becomes available it not a problem, it is a problem-solver. Instead of looking at the cost of providing a guaranteed job or an income until a job becomes available, let’s examine our country’s priorities. How many trillions of dollars did we spend on the Iraq war? We have spent and are spending how many trillions on “security” since 9/11? How many trillions have we spent on the military at roughly a trillion a year? How many trillions have gone to tax breaks for the wealthy and giant corporations? Today we spend billions upon billions giving companies tax breaks to move jobs and factories and profit centers and entire industries out of the country! We seem to come up with trillions upon trillions of dollars to spend on military and “security” even when there is no country that could possibly invade us. We maintain expensive military bases around the world because … who can answer that? We fight an ultra-expensive terrorism war (and maintain a vast, ultra-expensive surveillance system) because 3,000 of us were killed more than a decade ago yet we do not fight a war on tobacco executives who make a product that today kills more than 400,000 Americans each year. Those 400,000+ Americans killed each year (how many hundreds of thousands more were sickened?) were not a priority to us, for some reason. So “cost” is really a question of understanding our priorities and values. We prioritize tax breaks for the wealthy and giant corporations, and we prioritize trillions for a vast military, and then complain that it would “cost” a lot to employ the jobless maintaining our infrastructure and teaching our children and caring for the sick and elderly and providing daycare and other things would make the lives and economy of We the People better. How We Can Provide Full Employment? But seriously, could full employment be accomplished if we did place a priority on doing this? Is there really that much work that needs to be done? First, keep in mind that every new jobs boosts the economy. Because every new job is another person shopping at local stores, and every few new jobs mean the stores are hiring, too. Etc. To provide full employment for all we could start by restoring the 900,000 jobs that the current “sequester” is costing the country. And think about the boost to the economy that these 900,000 jobs would bring. We could hire back the more than 700,000 teachers, police, firefighters and other public employees that have been laid off since 2008. And think about the boost to the economy that these 700,000 jobs would bring. We could just bring the country’s infrastructure back up to standard, never mind modernizing and getting ahead of the world again. The American Society of Civil Engineers say we need to put about $3.6 trillion into that just to catch up to where we were before the Reagan tax cuts and military buildup caused us to defer maintaining the infrastructure. Think about the millions of jobs and businesses that would create and the huge boost to the economy doing this would bring. We could retrofit every home and building to be energy-efficient. Start with simple things like sealing leaks and painting roofs white, then move to better windows and insulation. And then how about replacing old furnaces and air-conditioners with super-energy-efficient units? (Of course use American-made everything for these projects.) When we have finished doing those things our economy will be vastly more energy-efficient and all of us would pay less to heat and cool houses and buildings — so the project pays for itself. There’s another several million jobs and the boost to the economy that brings. Right there are just a few items that, if we would just do them, would probably bring full employment and a tremendous boost to the economy. And these are just things that really, really need to be done at some point anyway! If there isn’t that much work that needs to be done we could just legislate a 30-hour workweek the same way we legislated a 40-hour workweek. (Yes, We the People can just do things like that.) But we do not do these things. But how about going just beyond catching up with the things that we have been putting off doing, like fixing roads and bridges? Let’s dream for a minute about doing things for We the People! How about investing in universities and providing free college or university educations for everyone who wants to go, all the way through to a Ph.D.? How about providing free childcare for every family? How about a huge investment in scientific and medical research? How about providing all the rapid transportation we need in cities and between cities? How about replacing every coal power plant with a renewable power source? What would these things do for our economy and our people? Let’s dream. Let’s shift our priorities. Martin Luther King outlined his dream 50 years ago this weekend. And We the People moved on that dream. And we made much of it happen. Let’s dream some more. Let’s dream about what we could do in the next 50 years. Maybe we can spend some money on jobs, and until we reach guaranteed full employment let’s provide a guaranteed minimum income until a job becomes available. Because jobs and income fix so many other problems. And maybe we can re-adjust our priorities, and do things to make the lives of We the People better. Because that is what democracy does. You might say I’m a dreamer, but I’m not the only one.